Absolutely Extraordinary Bi-Level Huge Apartment Nestled Between Queen West And Dundas. High Demand Location. Sun-Filled Large Windows, Wood Floors Exposed Brick With A 2 Piece Bath On Lower Level. Ceilings Over 9 Feet With 3 Entrances. Spa Inspired 4 Piece Bath On Main Floor With Large Bedroom And Den With Walk Out Patio. 2 Level Apartment Has Separate Hydro Meter And Own Furnace. Shared Laundry .Apartment Is Up To Fire Code. Many Closets Throughout. Meticulously Maintained And Superb Craftsmanship Through -Out. 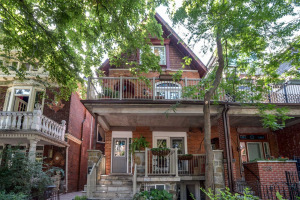 Two Minute Walk To Queen St West And Dundas.